Ever since Kim Jong-un took over as the young, untested ruler of North Korea seven years ago, he has promised his country a future free from deprivation. In his first speech as leader, he vowed that North Koreans, millions of whom starved during a famine in the 1990s, would never again have to tighten their belts. Last year, he apologized to the nation for failing to live up to that pledge, expressing how “anxious and remorseful” it made him. Then, this year, he proclaimed a new shift to North Korea’s 25 million people: Now that the nation possessed a nuclear arsenal, it could change gears and start building a prosperous economy, after years of international sanctions. So when President Trump on Thursday abruptly canceled their much anticipated summit meeting on June 12, the North Korean response was remarkably diplomatic and cordial, holding open the hope that the meeting could still take place, after all. In a sign of just how important the summit is to Mr. Kim, he held an unexpected meeting on Saturday with President Moon Jae-in of South Korea, where he expressed a “fixed will” to try to salvage it. The measured response to the cancellation, and the extraordinary diplomatic scramble that followed, was a strong reminder, analysts said, that Mr. Kim not only wants a diplomatic deal with the United States. He may need one. Mr. Kim’s stated desire to continue engaging with Mr. Trump — even after such a high-profile snub — does not necessarily mean the North Korean leader is willing to renounce his nuclear arsenal, the primary American demand. No matter how painful sanctions may be, analysts say, Mr. Kim would be unwilling to give up his nuclear weapons unless an accord left him feeling completely safe without them. The security of his family-run regime is a nonnegotiable priority. North Korea has emphasized that it wants security guarantees and will not trade its nuclear arsenal for economic benefits alone. It has also rejected assertions that it has been pressured into talks because of the pain of sanctions, adding that it does not expect help from the United States in pursuing economic development. Indeed, the North Korean economy has been growing as much as 1 to 5 percent annually under Mr. Kim’s rule, because of a limited embrace of market forces by his government and, until late last year, loopholes in the multiple rounds of sanctions adopted by the United Nations Security Council. Still, his apparent willingness to continue diplomatic efforts does suggest that Mr. Kim, 34, may be under pressure to satisfy rising expectations in North Korea for economic gains and shake off the painful grip of sanctions. While largely depicted as a nuclear provocateur in the outside world, Mr. Kim is determined to be the face of a modern and more open North Korea at home. He has erected new buildings and repainted old ones in Pyongyang, the capital, attended a concert by a South Korean girl band and let a state orchestra play American pop music. Mr. Kim has also sent party officials to China to learn its economic policies, and has even admitted to other failures during his supposedly faultless leadership, like a botched satellite launch in 2012. When he met with South Korea’s president, Moon Jae-in, last month and invited him to Pyongyang, he asked Mr. Moon to fly there because North Korea’s roads and trains were in such “embarrassing” condition. The contrasts between the North and South are particularly stark. North Korea generates a tiny fraction — less than 5 percent, by some estimates — of the electricity that South Korea does, leaving passengers stranded for hours in immobilized trains because of widespread power shortages, according to defectors from the country. The dueling economic realities of the two countries are on clear display from space: Even now, nighttime satellite photos show the southern half of the Korean Peninsula splotched with bright lights, while Mr. Kim’s North is shrouded in darkness, with only a pinprick of light indicating the location of Pyongyang, where the nation’s elite lives. Without a doubt, North Korea has come a long way since the 1990s, when mass starvation stalked the population and the country was so energy-starved that travelers camped out in stations for days waiting for trains. Since taking over after the death of his father, Kim Jong-il, Mr. Kim has installed water parks, ski resorts, a new airport, skyscrapers and even a dolphinarium. 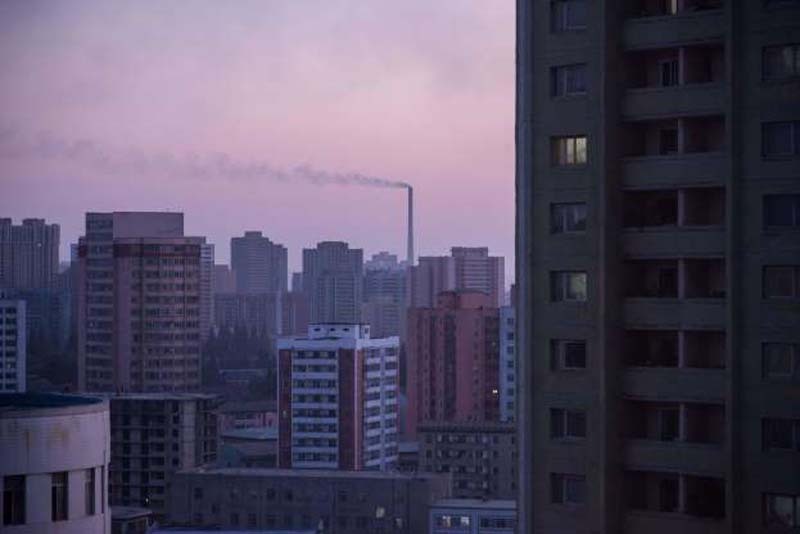 Cellphones have become a common consumer item in North Korean cities, although the country remains mostly shuttered from the global internet. But for all his efforts to portray himself as vigorous, approachable and goal-oriented, there is a limit to how far Mr. Kim can go under international sanctions, analysts say. The domestic pressures on him are compounded in some ways by the growth of markets he has introduced and the emergence of a moneyed class in Pyongyang. Under Mr. Kim, a new generation is growing up exposed to DVDs and flash drives of South Korean soap operas and movies, raising expectations for a better quality of life. Mr. Kim has the power to rule his country and suppress dissent through extreme brutality. There is no political opposition. He is believed to have ordered dozens of executions, including the killing of his own uncle, and North Korea still runs a network of prison gulags. Mr. Kim keeps the elite on its toes by frequently purging and reshuffling senior military and party officials. But he is also eager to be seen as “people loving.’’ Building a “strong socialist country” is his catchphrase. Recent visitors say Pyongyang looks more colorful and prosperous than it did a decade ago, with stores stocked with imported and domestically produced foods. But conditions outside the capital remain dismal, with widespread malnutrition among children and nursing mothers, according to United Nations relief agencies. The most recent round of sanctions in the American-led “maximum pressure” campaign has undercut North Korea’s ability to earn hard currency needed to buy imports. Since September, the United Nations Security Council has banned all major North Korean exports, including coal, iron ore, seafood and textiles. If enforced fully, the sanctions could eliminate 90 percent of the country’s total exports. North Korean exports to China, which account for more than 90 percent of the North’s international trade, fell by one-third to $1.65 billion last year, with volumes plunging by as much as 95 percent in recent months. The United Nations sanctions also cut the North’s imports of refined petroleum products by 90 percent, causing gasoline prices to double. Many mines and factories have closed for lack of raw materials or export orders, according to South Korean and Japanese news organizations. Investors and fishermen have deserted fishing ports, after lucrative exports to China were blocked. Last year, four North Korean soldiers defected to South Korea through the heavily armed border. One of them braved a hail of bullets while fleeing. When South Korean doctors operated on him, they found his intestines riddled with worms. There is no sign of a return to mass starvation, experts say, and the country is believed to still earn substantial amounts of cash through smuggling, hacking and weapons sales. Mr. Trump’s surprise decision to withdraw from the summit meeting could also play into Mr. Kim’s favor, especially if China — North Korea’s main trading partner — blames Washington and chooses not to enforce sanctions as vigorously. In the weeks leading up the meeting, Mr. Kim had taken very public steps to lay the groundwork for negotiations, including releasing three American prisoners and suspending weapons tests. On Thursday, he demolished his country’s only nuclear test site. Mr. Trump softened his tone on Friday, saying a meeting might take place after all, but the diplomatic seesawing by the American president suddenly made Mr. Kim look like a reliable and consistent negotiating partner. Some analysts said Mr. Trump’s initial decision to scrap the summit meeting was a hiccup before a return to dialogue. Others said that if the two nations failed to get diplomacy back on track quickly, Mr. Kim could feel growing pressure to resume weapons tests to pressure the United States and “salvage his fallen status at home and abroad,” said Cheon Seong-whun, an analyst at the Asan institute in Seoul. While Mr. Kim may wield tremendous power, his longevity as North Korea’s undisputed leader is not guaranteed. Mr. Kim’s engagement with Mr. Trump may be unsettling to senior figures in North Korea’s military who worry that he could, in fact, relinquish the country’s nuclear arsenal, which he has called a “treasured sword” that ensures the country’s survival. At the same time, Mr. Kim’s failure to meet the expectations he has raised for greater prosperity at home could anger the people who already have had a taste of a more affluent life.